The Active Jac has been a favorite on American ranches, farms, and factory floors since its release in the '70s. This boys' cold-weather version is made of durable cotton duck that looks just like dad's but feels broken-in from the start. The flannel lining ensures kids stay warm whether they're running around the park or the orchard. This jacket is comfortable, durable and warm. I bought this for my nephew and he loves it! Overall very happy with this jacket. 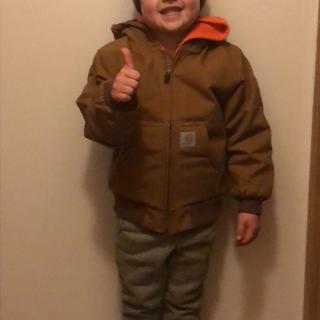 My son loves his Carhartt jacket! As he says, it’s just like his uncles and papas! 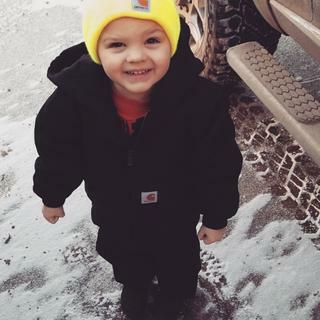 Jase loves his new Carhartt jacket. Keeps him warm when he helps with chores! My boy likes to wear work clothes like daddy and I’m proud to get him exactly that from Carhartt ???? Top notch Carhartt quality! My son loves it, because it is just like Dads! I like the quality of the coats I bought. Purchased for my grandson. He loves it. Great jacket for my 6 year old to wear around the farm! All around like Carhartt outerwear. Durable/wear well. The shipment was 2 days early. Packaging was adequate. I felt the zipper was of inferior quality as compared to previous jackets. I hope the fabric holds up. This is a great jacket for those cold winter days it keeps you warm while you are out working. Awesome jacket. Clean appearance. My son loves it! Awesome jacket. Great for Christmas and durable. Great Coat! Worth every penny. I love the active jac. I'm on my third one in 20 years. It is a warm durable piece of outwear that I use every day from December through February. My only misgiving is that when it arrives the coat is impregnated with a water-resistant coating that wears off after several washes. And although its not intended as a rain coat per se, I often wear the coat in damp conditions and wish there was a way to reapply that coating. The jacket was perfect. Ordered online from Canada and received within the two weeks. Would definitely recommend carhartt. This little jacket was a baby gift for a friend. I'd asked her about it before I ordered it, and she was very excited to get it. In fact, her toddler can wear it now, and the baby can grow into it. Every man needs a Carhartt jacket! Very nice coat and arrived very quickly and our son likes it a lot! Excellent jacket and well worth the price! The jacket was for my grandson and is plenty big with shirts/sweaters underneath. He is comfortable in it and likes it because his daddy has one. As always, Carhartt is a great brand. Our grandson likes his jacket. He enjoys building outside and his jacket will keep him warm. Great coat!! I ordered an xxs for my two and a half year old. It's a little big but he'll definetly get some use out of it which is what I wanted! It's very thick in the chest area I'm very happy! Standard Carhartt quality for my family. Great jacket with comfort and quality in mind. My son loves his Carhartt jacket. He is a Carhartt fan overall. I have to say, this jacket is probably the most durable coat I have ever purchased for him. It's very warm and heavy-weight. It's also nice that it has a hood for our rainy weather in the PNW. Great quality, very cute - highly recommended! Men's jacket shrunk to kids size! If you need a warm jacket for your kids this winter this is the one! It has worked perfect for my son and it's adorable! 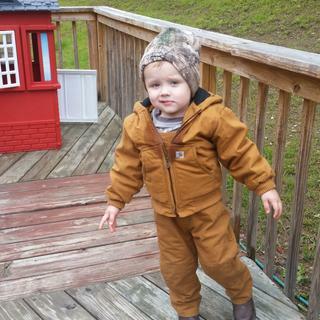 In his Carhartt bibs and jacket! This coat was meant for my son but ended up being too big for him. However I kept it for myself and is very warm and I enjoy it. Usually I can find something wrong with anything but not this time! This jacket is great for my 9 year old. He wears a steady size 8. I got him the small 8-10 and it's perfect. Just a little room to grow without that oversized look. It's tough on the outside and soft on the inside. I feel he'll be well protected from the elements. Well worth the cost. Super happy with my little big boy jacket just like his daddys. fit was great and love it for those cold days. ! BEST ANSWER: Please contact us at 1-800-833-3118 with the color and size you are interested in and we will be happy to assist you further. BEST ANSWER: The sleeve length of the medium will be 29" while the Large will have a sleeve length of 31 1/4". A Medium in this item will fit a height of 52.5"-58.0" and a weight of 61 lbs - 88 lbs. What is the sleeve length for size large? BEST ANSWER: The sleeve length for a Large will be 31 1/4 inches. What is the sleeve length of size large? Does the jacket keep kids warm while they play in the snow? BEST ANSWER: Along with their hat & gloves, yes it does. I purchased the bib overalls this year, to keep legs warm. Other than that, I'm very very satisfied with my purchase. I hope this helps! It is a very warm jacket and good for snow unless they are really rolling around in it and/or it is a real wet snow. Don’t know about snow but keeps my kids warm in Texas. How are these coats for car seat safety? BEST ANSWER: We take ours off for the car seat. Look up general car seat safety guides and they tell you not to put kids in car seats with any jackets. But this one would be very uncomfortable in a car seat. Google car seat safety with winter coats and watch the video on the Today website. We have had absolutely no problem with this jacket in any way. He wears it all the time. Loves it. What size in months would the XXS be? BEST ANSWER: The size XXS would be equal to a boys size 4/5. It will fit children that weigh 34.0 – 44.0 pounds and are 38.0 – 44.0 inches in height. BEST ANSWER: Please contact us at 1 800 833 3118 for sizing guidance. You can also refer to the size and fit guide on our site. I go a size bigger. These jackets last. You might as well get 2 Winters out of them. Does this coat contain any polyester? My son is allergic to polyester. BEST ANSWER: Yes; the lining includes polyester. what size do i need for my kid if his chest size is a 34? BEST ANSWER: This style is sized based on height and weight. You are welcome to use our Size & Fit Guide with the measurements. Feel free to contact us if we can be of further assistance. whats the chest size for L or XL boy jacket? BEST ANSWER: The large measures 42.5 inches and XL measures 44 inches (+/- 1/2 inch). This is measured from the bottom below the armhole. Those sizes are for adults. I'm looking for the sizing for kids L and LX chest size. The information provided above is actually correct and applies to style CP8417. The chest circumference 1" below the armhole would be 42 1/2" in a boy's Large (14-16) and 44" in an XL (18-20). WHEN WILL YOU HAVE LARGE SIZE, BLACK, OF BOYS ACTIVE JAC? BEST ANSWER: We plan to restock around the beginning of February 2018. BEST ANSWER: This garment is not considered waterproof. Is this a winter coat.? BEST ANSWER: Yes, this jacket has a quilt lining for warmth. Do you have a Carhart jacket made in the USA ? BEST ANSWER: We do not have a children's jacket made in the USA. However, styles J140, J131, and J001 are all made in the USA. What size would i need if my little guy wears a size 10 in boys? BEST ANSWER: We recommend a medium. BEST ANSWER: No, this jacket features an attached hood. what is the difference between this and the taffeta quilted jacket? BEST ANSWER: The Taffeta Quilt Lined Work Active Jac (Style CP8489) is going to have a lighter shell, a 9 ounce material, verse the 12 ounce on the Active Jac (Style CP8417) . The Flannel lining is also considered warmer than the Taffeta lining. What size should I get for an 11 year old? BEST ANSWER: Our sizes are based on height and weight. We recommend using our Size & Fit guide using these measurements. Please feel free to contact us for further assistance. does this jacket have interior pockets? Yes, there is one interior pocket on the inside left. Yes, one interior pocket on the left. BEST ANSWER: A boy's size large is intended for a weight of 89-116 lbs and a height of 58.5-64." A boy's XL is intended for a child weighing 117-138 lbs with a height 64.5-69." It sounds like a boy's XL would be a better fit. However, this does not account for an adult waist size, chest size, etc. If you need further measurement details, please call Customer Service at 1 800 833 3118. Where is this imported from? I thought they were made in USA? BEST ANSWER: This style is made in Vietnam and Indonesia. My son is a very tall thin 7 yr old. He's 52 in and 50 lbs. The medium is the right length, with room to grow, but will it be overly baggy on him? BEST ANSWER: If he is very thin, it may be too baggy on him. The chest circumference 1" below the armhole is 39.5." The circumference of the bottom opening at the seam is 38." Does the children coats run small ? BEST ANSWER: We recommend selecting a size based on the child's height and weight using our size chart. This children's coat is made just like the adult coats. The coats are very well made. Your child will grow out of it and it will still look and feel like brand new. The jackets do not run small. If anything they may even run slightly bigger. I suggest choosing a jacket size one size larger than your children actual size. This give room under the jacket for additional layers of clothing and also additional room for your child to grow into and use again next year. I think so. I bought my son a large when a medium would normally fit him. The medium was a little too snug. The large is a hair too big, but it works very well. Hi there, in our experience if anything they tend to run a bit big. We have typically been able to get 2 winters worth of wear out of the same size for my boys. I am a 5'3 120 pound woman. I bought a kids XL to wear! I have a small frame though. If anything they seem to run a little big. 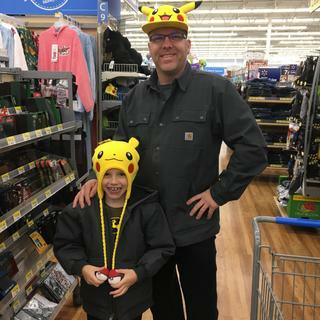 My son is 13.8 years old (116 lb and 5'2) and I purchased a size L 14-16. Fits perfect with a little room to grow. No the childrens coat runs fairly true to size; but a big on the larger side if anything. It is very nice. No. In fact the size 5 was plenty big for my grandson. It is very nice. A great coat at a great price. Does the hood on this coat have a drawstring? BEST ANSWER: No drawstring. Pretty sure they're banned from children's clothing. There's a slight elastic in there instead and it is not exposed or adjustable. The hood on the boys' jacket does not have a draw string. It's still a great jacket! No, the hood does not have a drawstring. Great coat otherwise. No their is no draw string on the hood of this jacket. Does this coat have a plastic zipper or is it all metal, like the mens jackets? BEST ANSWER: It has a metal zipper. Very sturdy and nicely made. I want to buy a jacket for my grandson. He lives 3 hours away. He wears a size 12 in boys.How do I know what size to get? Medium, large? BEST ANSWER: A Medium is recommended for sizes 10-12 and Large is recommended for sizes 14-16. My grandson is 4. I purchased the jacket to last him a least a couple of seasons the size chart is very good to use. The medium is going to fit him now, however a large would last him through next winter too. The jacket will definitely not wear out in that time. Are you able to wear this in the snow and play in it like sledding? BEST ANSWER: Yes...they are perfect for weather like that and keeps them warm. We do not live where it snows very often, but it rained since the holidays and he wore it outside driving his little police car all around. It worked great for that.